Who would have predicted that the legacy of Guess Who’s Coming to Dinner (1967), Hollywood’s inspired response to US racial integration anxiety, would be the dire 1980’ genre of culture-clash comedy. Chief among this sad bunch was Carbon Copy, a 1981 film in which the main character, a successful white businessman whose life is turned upside down by the sudden appearance of an illegitimate black son, utters these immortal words: ‘I’m Jewish, my son is black and my lawyer smokes pot. Don’t tell me I’m not in trouble.’ According to legend, actor Denzel Washington was so embarrassed by his eager cinematic debut as the son in question – a grinning, wide-eyed stereotype – he tried to buy back all physical copies of the film. In response to the rumour, London-based artist, John Lawrence has embarked on a project to collect and create new works from the film’s original promo-posters. In his solo exhibition ‘Original Carbon Copy’, ten framed posters from this ongoing series were hung side by side, to create a panorama of Postmodern minstrelsy. Each piece was made by working on the same basic image – a beaming Washington reaching out to shake the hand of his flabbergasted dad. To create a third image that was a combination of the original and its digital referent, Lawrence purchased the original movie posters online and then printed the corresponding eBay seller’s proof-of-condition JPEG’s on top of each one. This tautological foundation – the layering of a thing that references itself – bears the influence of linguistically orientated Conceptual art of the mid-1960’s and early ‘70s. But what separates Lawrence’s work from a repackaging of, say, Joseph Kosuth’s One and Three Chairs (1965) is his use of subject matter traditionally associated with Pop. Alhough negation through repetition, the fate of Warhol’s subjects in works such as Statue of Liberty (1962) and the ‘Mao’ series (1972) is not how these works operated. Lawrence’s process of reproduction brings his chosen subject to life, or at least back into the popular consciousness, carrying with it new symbolic resonances. Although the tale of Washington’s attempted cover-up is probably apocryphal, there’s an underlying accord with our futile desire to shape and control our own images and identities, lending it the quality of a modern fable. As a result of digital photography and social networking, it’s not just Hollywood stars that have a collection of past selves doing the rounds; today we’re all generating a vast catalogue of images that could resurface at any moment to undermine who we currently think we are. The moral of the story is that the guarded maintenance of a singular and consistent personal identity is a vain pursuit for all. The appearance of Lawrence’s images is formally quite surprising; these are not the neat photomontage or double-exposure superimpositions one might expect. Because of the low resolution of the seller’s digital images, enlarging the JPEGs to cover the area of the original posters caused, in some cases, quite expressionistic distortions (a process that recalls Thomas Ruff’s 2007 JPEG series). In one print, the actor playing Washington’s father is given the appearance of a nightmarish, half-made-up clown. The colour blend from the superimposed image has left him with dripping mascara, hair dye and red lipstick, turning his look of surprise into one of camp indignation. In other iterations, evidence of the seller’s domestic environments – table tops they photographed their item on, for example – frame the prints with blocks of colour and form giving the overall image a compelling, aleatory sense of abstraction and collage. The final flourish (or accident) of this doubling process is the return to tautology. 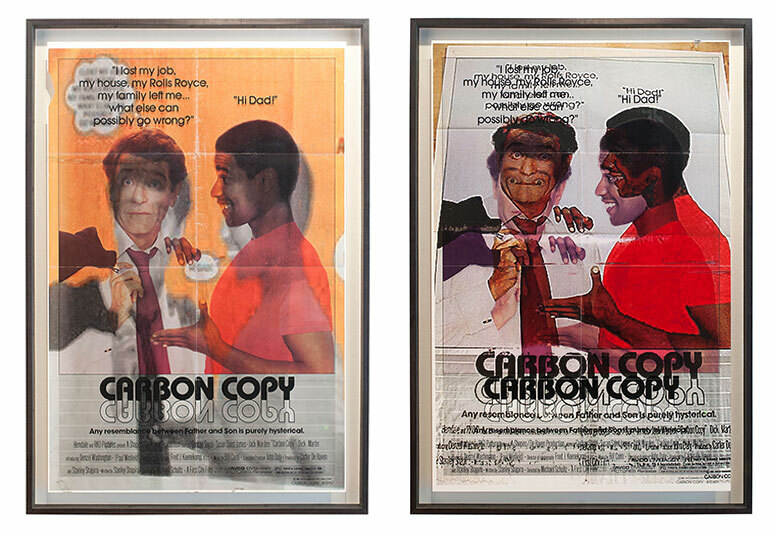 Carbon Copy, the title of the movie, doubled on the original poster, is in each image quadrupled into self-reference. What Lawrence achieves in these ten prints is that perfect, and rare, contemporary synthesis of pop-cultural reference and symbolic depth. They are clever contributions to what may be – depending on how copyright law is enforced after Richard Prince’s case – the dying medium of appropriation. Still, while Lawrence’s appropriation of promotional material may never legally constitute fair use, the starched conservatism of Washington’s carefully constructed persona most definitely constituted fair game.